The Kiss by Robert Bissell. Robert Bissell grew up on a farm in England, surrounded by the beauty and magic of the natural world. In his paintings, he loves to playfully imagine the lives and experiences of wild animals, such as the gentle encounter portrayed here. When he isn’t painting rabbits and butterflies, he paints bears, rats, kangaroos, dragonflies, and a host of other creatures. 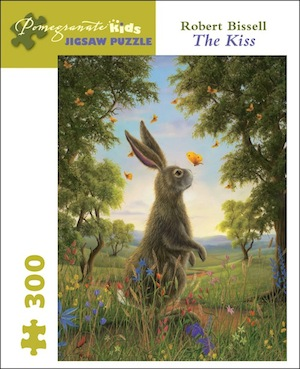 Thoughtfully crafted with large pieces, PomegranateKids 300-piece interlocking jigsaw puzzles combine kid-friendly artwork, superb color reproduction, and sturdy construction to delight young puzzle solvers for years to come. Puzzle size 18 x 24 in.